Late Mother Teresa's Order Investigated For Child Trafficking In India A nun and a worker at a Missionaries of Charity shelter were arrested last week for allegedly selling four infants. India has mandated the investigation of all such facilities run by the order. 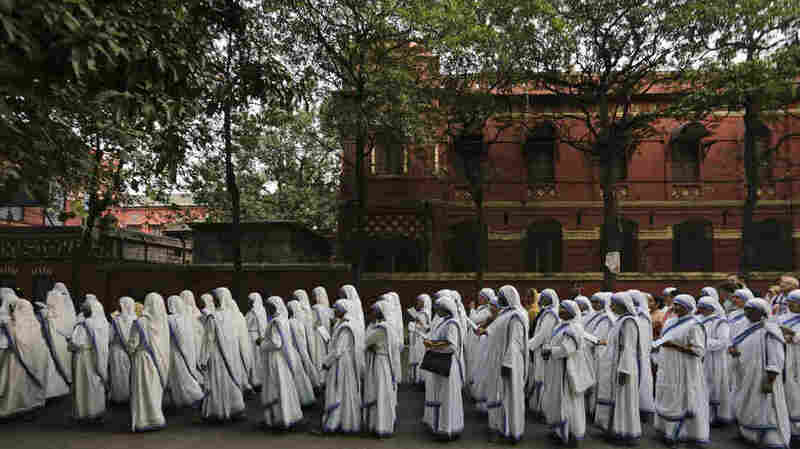 Nuns of the Missionaries of Charity, the order founded by Mother Teresa, walk in annual Corpus Christi procession organized on the Feast of Christ the King in Kolkata, India, in 2016. A nun, identified as Sister Koncilia, and a staff member, Anima Indwar, were arrested in connection with trafficking. According to The Times of India, Indwar confessed to selling the children. At the time of the arrests, a dozen pregnant women were living at the shelter, according to Catholic News Agency. CNA reports that one couple reportedly paid Indwar 120,000 rupees ($1,760) in exchange for a child, but that she later took the child back without returning the money. The couple then tipped off police, according to CNA. India's NDTV cites an unnamed police source as saying all four babies were sold within the past year. The Times reported on Monday that the last of the four, the 6-month-old boy, had been located and recovered. The newspaper said he was bought by a couple living near Ranchi. "We are getting many leads, but we cannot divulge them as of now," Ranchi Superintendent of Police Anish Gupta was quoted by the Times as saying. "We are working on verifying them," Gupta said. In a statement on Monday, Women and Child Development Minister Maneka Gandhi said she had instructed states "to get child care homes run by Missionaries of Charity all over the country inspected immediately." Gandhi's ministry said that under India's Juvenile Justice (Care and Protection of Children) Act, shelters dealing with adoption must register with the Central Adoption Resource Authority. However, it said some 4,000 institutions have yet to comply more than two years after the law went into effect. Missionaries of Charity discontinued adoptions in India in 2015, saying it disagreed with government rules that made it easier for single, divorced and separated people to adopt children, according to the Australian Broadcasting Corp.
"There was no question of selling any child as the Missionaries of Charity had stopped giving children for adoption three years ago," Samita Kumar, spokeswoman for the order, was quoted as saying by CNA. Kumar explained that even when the order did process adoptions, it never accepted money for them. Missionaries of Charity was founded in Calcutta, now known as Kolkata, in 1950 by Albanian nun Agnes Gonxha Bojaxhiu, later known as Mother Teresa. The order she founded expanded internationally and went on to become best known for its care of the sick and dying, particularly with facilities such as the Home for the Dying Destitutes in Kolkata, in eastern India. She was not without detractors, however, including the late writer Christopher Hitchens, who said Teresa was focused on the need for the sick to suffer like Christ did on the cross, rather than on relieving their pain. As The Washington Post writes, she was also criticized for her relationship with dubious personalities, such as Haitian dictator Jean-Claude Duvalier and disgraced financier Charles Keating.